My old manual focus 200mm Micro lens has captured several of the sharp shots in this gallery, but in this case it accidentally created art, for as the shutter speed I chose was high enough to freeze most of the butterflies moving as they flittered about, this one trying to balance itself on it's precarious footing, beat its' wings at a rate that out paced my shutter. When I looked at the shot later I rather liked the effect. Wow, this is absolutely FANTASTIC!!! Wow - this is neat. Love the feeling of motion. Brilliant. 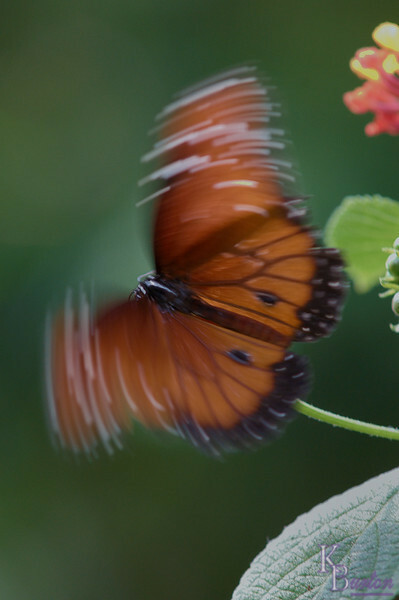 In motion is a lot more difficult than capturing a butterfly sitting.